Dina Kowal Creative: Happy birthday to my blog! I'm grateful - for the people I've met along the way that have pushed and encouraged me, believed in me, and told me to keep creating, keep pushing my boundaries. This isn't my 'day job' but it gives me an outlet for times when life and ministry get overwhelming. Thanks for visiting, leaving comments, and asking questions - I love that! So I was thinking it would be fun to share some love here for all you share with me. I painted this little 4-inch canvas the other day, and would love to send it to one of you. I used acrylic paints and stamps from Impression Obsession, Sweet 'n Sassy, and smARTworks, plus a digital stamp that I designed myself. 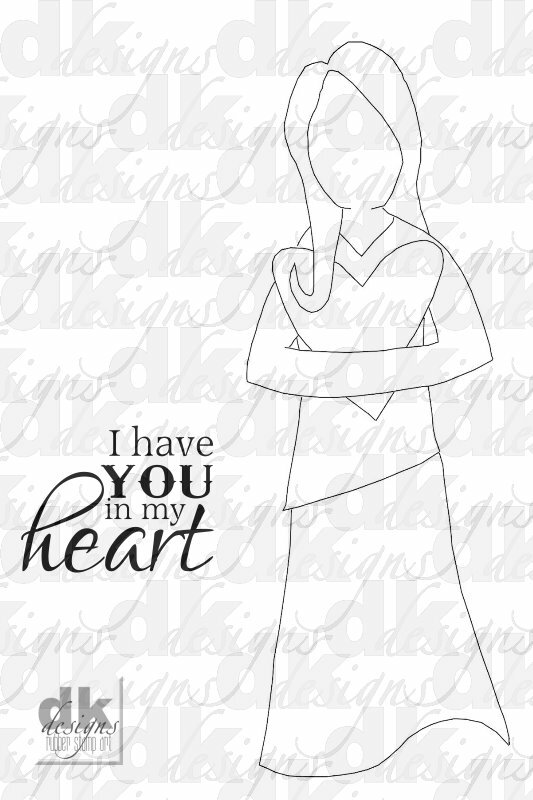 This "Holding My Heart" image isn't available anywhere but here at this time... yet! The actual image is six inches high, so it can be resized for different sized canvases, pieced, or colored as is. As an additional prize, I'd like to send out 10 limited edition digital stamp sets. All you need to do to qualify to win is leave a comment under this post! I'll announce my 11 winners on Wednesday, so you have until Oct. 30th at midnight EST to leave a comment. Happy 6th Birthday to Mama Dina's Blog! Seriously this is really awesome Dina. It's been fun to peak every once in a while when I'm taking a coffee break. You've made some beautiful things, but mostly what I like is the Creator in you is being manifested and glorified. Keep creating for HIM! Happy birthday to youuuuuuuuu!! Happy birthday to youuuuuuuu! Happy Birthday, dear Dina's blooooooooog, Happy Birthday to youuuuuuuu! I had to do it, in honour of our lovely habit of breaking out into song! Thanks for all the inspiration and the beauty, Dina, both through your art and your love for Jesus, hugs, mf!! Your canvas is just breathtaking, Dina! Congratulations on six wonderful years of blogging! I can't tell you how much I love creating with your stamp sets...they make crafting beautiful cards so much easier! This new image is fabulous and just another example of your marvelous talent for designing! Hugs and blessings to you! I have LOVED reading your blog- regarding your stamps, your life, and your journey! This is GoRGEOus! Happy Happy Birthday to your blog and you!! What a wonderful journey! Your canvas is simply divine and I have the PERFECT place for it, as well as that adorable, sweet digi set. Pick me pick me! Here is to many more years of seeing your work. You inspire me! Happy Birthday! You've come a long way :) LOVE your canvas and digital image!! Your talent never ceases to amaze me. But the best thing of all is that your heart is just as big as the one she is holding. This is beautiful. I have never tried painting on canvas. Gorgeous variation of colors. Happy blog-birthday. Happy Birthday!! It is a quite accomplishment, Dini! You and your blog are truly fantastic! Happy 6th Blogiversary. Oh Dina, this canvas is absolutely beautiful. Congratulations on your 6th blogoversary! I've been following you for all 6 years! Such lovely gifts you are gifting out! Absolutely lovely...just like you who is offering them. The inspiration and your talents that you share daily through your blog are gifts we received from you daily. THANK YOU! And big hugs and cheers! Oh, Dina! How exciting...and you certainly inspire and encourage thousands around the world with your art and your faith! You are one of my all-time fave bloggers and artists! Congratulations! I LOVE this image and know a precious woman I would use it for to encourage her since the loss of her precious husband earlier this year. Big hugs today!!! Congratulations on six years! We are so grateful that you share you talent with us. You are indeed an inspiration. We have you in our hearts too! I still remember your visit here so well. What an amazing connection! Your art piece is beautiful, Dina. Happy Blog Birthday! Congratulations on 6 years Dina. Your work is beautiful. Love your canvas. Thanks for sharing and have a great weekend. How very wonderful to have such an incredible creative story to share! I love the art you've created, so much warmth and feeling in it! Congrats on 6 amazing years of creating and sharing your artwork! You've been blessed w/a beautiful talent! Thanks for 6 years of inspiration! Happy birthday to your wonderful blog! The canvas is lovely. Many congratulations on your 6th Blogaversary! I haven't been a Follower for long, but I always find something beautiful and inspirational when I visit. Your creation is stunning....so evocative of pure love. Blessings to you and yours. And go on (!?) (I do not know whether one says). Happy 6th Anniversary! I hope you have many, many more! Your canvas is just beautiful. Happy Birthday to your blog- and so glad to be inspired by you! Love the canvas you made- love the digital image- how awesome! I love everything here- from the tips on coloring to the dimension you achieve in your coloring to the tips you share! Congratulations Dina! Your talent and inspiration reach out to all of us. 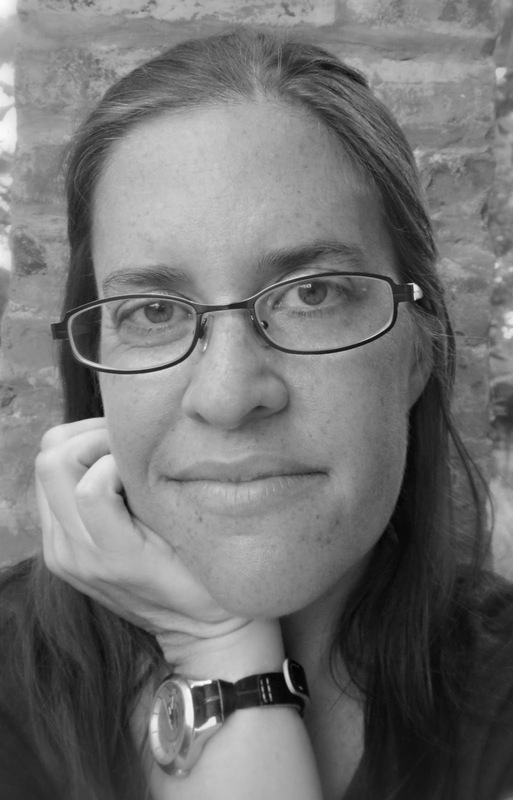 Thanks for sharing your world with us on your Blog. Happy Blog Birthday! Happy 6th Birthday. Wishing you many more birthdays. I may not always comment but it sure is a pleasure and a joy reading your blog. Love your cute little canvas painting. Sure would look great hanging in my studio. Thank you for your inspiration all these years, and best wishes for the years to come. May you always experience upliftment with your sharing of yourself and your talents and know that all of us out there appreciate all that you do. You will never know the happiness you bring to us with your creativeness. This is such a sweet image, Dina...such a reflection of you. Congratulations on six fabulous years. I love seeing all your creativity. I'm definitely a fan. I always love your stamp designs, and your coloring is amazing. Felicitaciones por tu sexto cumpleaños y también por tu creatividad. Tus trabajos son maravillosos. Gracias por compartir tu talento. love the canvas work.....very thoughtful. Makes one think of several stories behind the image. Happy 6th Blog Birthday. Your canvas is beautiful. I love the image. I hope it will be for sale afterwards. Bless you for your service to the Lord. Dina, your work of art is wonderful an I love your lady. She is not only perfect for a canvas but for an art journal as well. I take it that you will be selling this digi image on your site -- I will patiently wait cause I sure do want her. Congratulations on SIX wonderful years!! Congratulations on the 6th anniversary of your blog. I love your work and would be honored to hang one of your originals in a special place in my home. Congratulations Dina!! Just like you to give away something on your 'birthday.' :o) Thank for sharing your talent, instruction and a piece of yourself! What do you say....your work is beyond beautiful! You are such a multi talented artist in the mediums. It has been interesting to see how your work has evolved over the six years. I've only just started following so con grates on your 6th. I think your cards and coloring are absolutely gorgeous thanks for always sharing. Love your blog! Just love your style and creativity. Thanks for all the imspiration. Happy Birthday! Dina...I've followed your blog for quite sometime now...but it doesn't even seem that long...I bought my watermark from you a long time ago and still use them till this day...Happy Birthday to your blog and may you keep sharing your beautiful work with us for many more years to come...and I'll still keep following. Congratulations, Dina! Your blog is fairly new to me but I have been enjoying it immensely. I'm glad I found you! Dina, your canvas is adorable - thanks for sharing! I shall continue to look forward to seeing your art work every day. Your canvas is phenominal! What a great God-given talent you have and you certainly are using it. Congratulations! You certainly have been an inspiration to us all. Love your creativity and coloring. Even though I just "found" your blog I have enjoyed visiting and I love all your work. I love my necklace. The canvas is beautiful. Congratulation and I hope many many more years of inspiration. Congratulations on your blog. I really enjoy following you for the past year. Your art is so inspirational. Thank you for sharing. Congratulations! Your canvas is so beautiful. Love everything about it, especially the "Holding My Heart" image. 6 years! That is quite the milestone. Congratulations! I love following your blog. Thank you for all the inspiration. Congrats on your 6-year anniversary Dina! I love your designs and I especially love what you did with this painting on canvas. Amazing what one can do with stamps, markers, paper and imagination! Dina I have always been in awe of your incredible talent. You have truly been blessed. Thank you for sharing your God given gifts with us. Happy 6th Blog Birthday!!! You have been an inspiration to me several times. I love your blog and I'm glad you sharing with us!!! As usual you say what I think and create what I love and wish I could do even half as well as you. Congrats on six years and here's to many, many more. your blog! And lucky me for finding you!! I first discovered you on IO, with all of your beautiful stamps - I knew then I had to locate your blog,and I have learned many new things since finding you - Thank you very much! Happy birthday to your wonderful blog! I enjoy it very much! Oh Dina this is just incredibly beautiful. What a talent you have girl. I love this stamp and could use this so many many times. Cross my fingers and hope to win. Bless you. Your canvas art is beautiful! Happy blogaversary Dina! Six years is quite a milestone! Thanks for the continued inspiration! I also have the perfect spot on my craft room wall for your gorgeous canvas! My fingers are crossed! I absolutely love your canvas! All of your work is so inspiring but this canvas truly speaks to me! Happy, Happy Blob B-day - Love waht you do and glad that you share! All the best. Congratulations and Happy Blog Birthday! AND...your canvas is so absolutely beautiful...WOW! Thanks for sharing all your work. Congratulations! Six years is amazing. I love to stop in and see your pretty cards. Your coloring is to be talked about! What a great canvas! 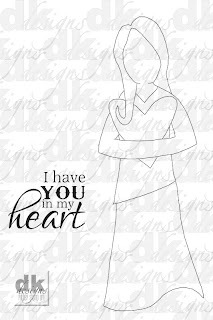 Really love the Holding My Heart image! Happy Blogaversary!